New Balance Vazee Summit - To Buy or Not in Apr 2019? As a decidely lightweight neutral daily trail trainer/runner/racing shoe, the New Balance Vazee Summit seems to bundle up all a trail runner could desire to feel confident to achieve peak performance. Preceded by the much loved but retired MT110 series, the Vazee Summit was released but not with just some minor tweaking to the original MT100 design. One review suggests that the entire blueprint seems to have been scrapped in favor of modeling one of New Balance’s respected racing flats, the RC1400, as the building block. With some of the more renowned names in the trail and ultrarunning arena nailing some great races while sporting long distance racing flats, a lightweight shoe with extra protection and grit for the trails seems like a great progression. So New Balance stepped in and took this concept and adapted it to incorporate protection adequate to cover any trail terrain. 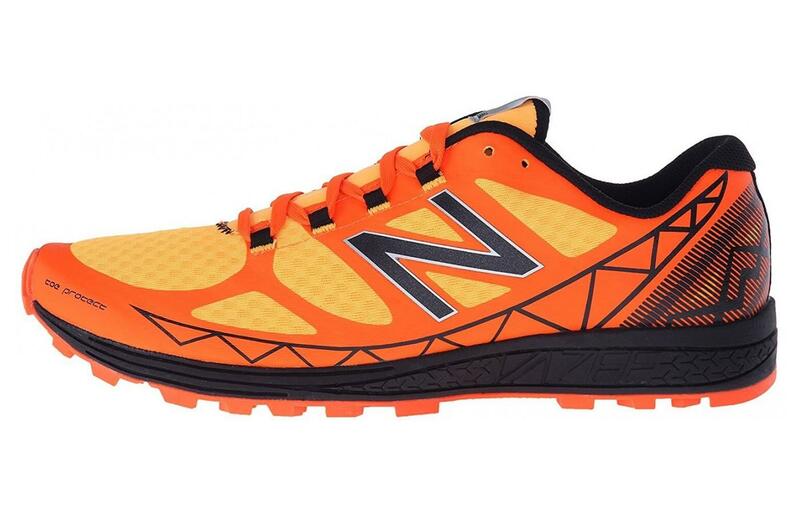 Garnering mostly favorable feedback, the New Balance Vazee Summit seems to have found a place in this niche but there are still some areas that could be built upon for an even greater experience for the runner looking to tackle the trails. Some feel that, initially, the upper is tighter and more narrow, but found it later to loosen up a bit to fit well while still locking down the foot. This security of fit is a huge plus when racing downhills when the foot can jam against the front of the foot or sway laterally setting one up for injury and at least discomfort. And, some found that the support offered did not meet the needs of the high arch runner and with a narrow fit it left little room for orthotics. But, by and large, with all it has to offer, it looks like New Balance is on the right track … or trail. 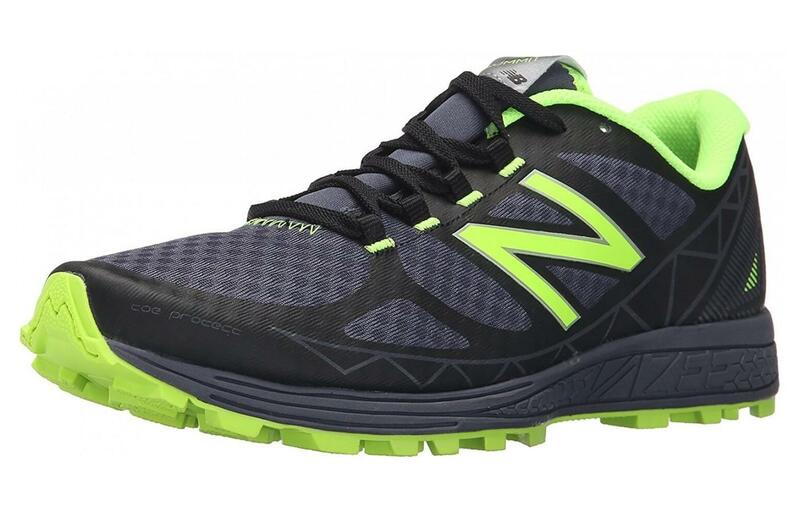 Overwhelmingly positive feedback yields favorable reviews for the New Balance Vazee Summit's performance claiming it is durable, comfortable, and tough making all terrain its playground. The oustole incorporates hydrofusion rubber that is exceptionally good at handling wet conditions. 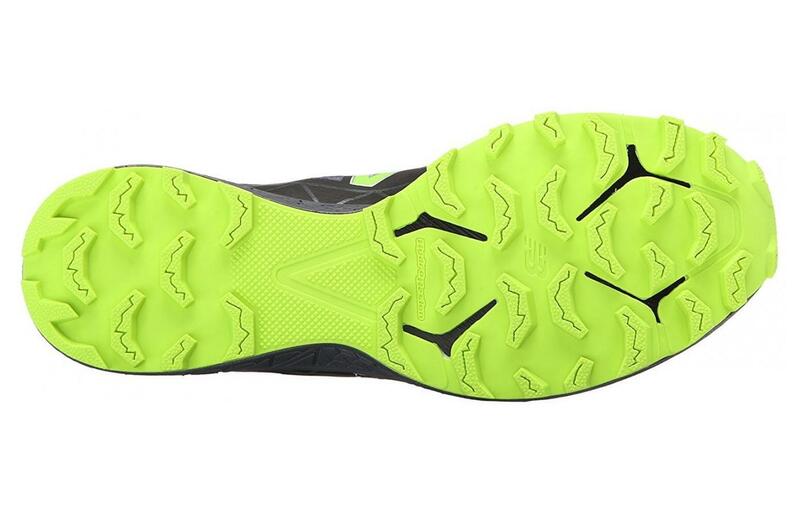 The large lugs of the outsole are also made of this hydrofusion rubber and prevent slipping by not accumulating mud and debris. Most find the FantomFit wrap inside the upper and its breathable mesh to feel very comfortable. The 3/4 rockplate provides additional protection against rocks and roots but because of the soft sole unit, the shoe does not lose flexibility making this shoe feel extra responsive. 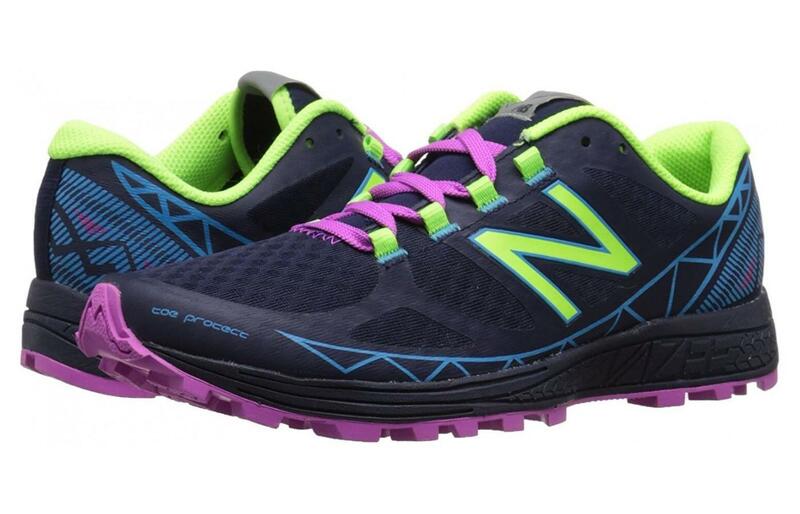 This trail runner is very lightweight and fits securely making for a swift ride. For all its features, the Vazee Summit is considerably more affordable than comparable models. The New Balance Vazee Summit seems to have a more snug feel. Even, if by design for security, some feel it is too narrow to be comfortable. Some feel the new fit offers little support to those with high arches and the snug fit precludes the use of orthotics. With a higher drop of 10mm concerning some, most found it to feel significantly lower and more comfortable than expected. We have spent 3.2 hours analyzing a total of 670 reviews. Got these for all types of tough running routes and I'm not disappinted at all, the lugs are good and don't pick up dirt etc, found these to be so good on wet muddy surfaces, the upper has an inside wrap which helps stability, the shoe line continues to be very protective, I have also noticed response has got better. Love the rapid ride in these, even on slippery surfaces i can keep up the pace, the shoes is light and I like the stability, for grip the lugs on these are way above other brands, when the weather is wet I know these are the shoes to use. Lots of flexibility eventhough it has this rock plate built in for protection, surprisingly light when considering the terrians I run in, breathability is nice but still keep[s out water, most important for me is the grip, the lugs are reliable no matter what surface. I like the fit in these it is so secure, the outsole is the best for preventing slipping, even on mud, I can say these are tough and durable and built for tough running conditions, I have used in all weathers, in hot weather the breathability is there and in wet the protection from water is good, for grip I can say these are certainly up to task. When I first ran in these I was cautious because they feel light and I do run some very challenging trails but these showed a high level of durability, the time when these really stand out for performance is in the wet, the grip stays so solid and reliable and unlike a lot of other shoes I'm not collecting wet clinging mud. Stability is really good, the shoes feel flexible all the time no matter what surfaces I hit, comfort in these is very sound and the stability gives me a feeling of being able to hit any surface and just keep going. The upper mesh looked like it might let in water but so far no problems. I have tried so many brands, I'm always looking for a shoe that really can take on any terrian in any weather, finally these shoes have proven themselves to be outstanding. As soon as i got these I hit a long run in the fall weather, it was wet, muddy and slippery and these shoes sailed through the challenge, very light, fantastic surface grip and very durable. I always use these, I change with each upgrade and for these I'm impressed with the better response, the grip remains the same and I know that I wont fall or slip, why do I like these so much? The price is gentle but the shoes is rugged, durable, reliable and super comfortable, 5 stars. Three months into these shoes and no signs of durability issues, for me these are my fall and winter runners, I know when i use these that i can go anywhere not matter how bad the weather and running conditions. A lot of shoe for an easy price. A lot of good points in these, if I have to come up with negative it is that this latest shoe feels a bit narrow, I'm breaking in these and I'm guessing they will stretch to fit. The arch support could be better but it's not enough of a problem to not run in these. A good shoe but unfortunatly i need shoes that work for high arches, as the shoe is a close fit I'm not able to use orthotics, still I can run in these but not long distances. Always used these, each shoe does have changes, this time around rather than better its not such good news because these are too narrow, the shoe continues to be really good but I need wider. The drop is 10mm and my feet and running style can't work with this, reluctantly I handed these over to my friend. The shoe fits so snugly that i can't get my orthotics into it, I need the arch support, never had this problem before with the previous shoe. These do run narrow, just wearing these for short runs to get my monies worth out of them. Of the 670 reviews we found in total, 11% were negative, and 89% were positive. The outsole of the New Balance Vazee Summit offers great traction with its hydrohesion rubber. Developed for wet conditions and upgraded for even more diverse trail conditions, it holds its own in this shoe. With effective patterning and durable long-lasting 4.5mm lugs, this shoe is surprisingly soft and responsive. But despite higher mileage, it retains durability. The good size lugs do not seem to trap dirt or debris requiring cleaning thus allowing for cleaner, more efficient, less slippery foot strikes. The midsole of the Vazee Summit is crafted from REVlite foam, which offers a responsive and soft, yet durable, ride. Taken from the last of the 1400 racing flat, it offers a little more compliance than other New Balance lines. Described as neither firm nor soft, it just cushions the blow of each foot strike, making for a more efficient stride. And while this shoe took some breaking in for most runners, it was evident after a short while that it was up to the task quickly making the Summit a go-to pair of trail kicks for many. The New Balance Vazee Summit features a soft and seamless single layer of breathable mesh wrapping from forefoot to saddle, with welded synthetic overlays covering a large portion of the foot. Despite this, many report that it is not constricting as expected and actually just contributes to an overall snug, secure fit. FantomFIT wrap is a thin, stretchy material that encapsulates the foot within the walls of the upper, creating a sock like fit. The plastic heel cup helps keep the foot in place and the lined collar helps it do so comfortably. Taking its cue from the last of racing flat, the New Balance Vazee Summit debuts a refreshingly lightweight trail shoe even with all the added grip and protection. Weighing in at 9.3oz for men and 7.7 oz for women, most find this shoe to feel effortlessly light and help them maintain quick paces as they glide over the trails. The upper of the New Balance Vazee Summit is a one layer of breathable mesh that runs the front of the foot. Despite the plentiful seamless synthetic overlays and the slipper-like FantomFit wrap inside the upper, most say this shoe feels exceptionally breathable and maintains a cool, dry environment for feet. It even drains water well. lightweight socks, really helped them feel more comfortable with the shoe as it gradually seemed to conform somewhat to the foot. Still, some found the shoes to still feel too small despite the upsizing and lamented having to return them as they liked the shoe otherwise. But, with its softer than expected sole unit and the soft padded collar and tongue and the FantomFit wrap of the upper, many felt that comfort was acceptable and some reviewers even claimed that these shoes temporarily alleviated the pain of plantar fasciitis. New Balance really seems to have nailed the style of this shoe because even the reviewers that had to return the shoes because of sizing issues did so regrettable claiming the overall look was stylish, and even cute to some. Available in Impulse/Lava and Black/Thunder for men and Abyss Toxic and Reef/Equinox for women, many were pleased with these options. The breathable mesh wrapped in well placed synthetic seamless welded overlays look sporty, the traditional flat laces that lend a classically reliable air, and the N logo largely displayed on the side work well together for a shoe that not only performs but looks like it does. Overwhelmingly viewed as long lasting, some reviews claim up to 500 miles with little wear and some have really put these shoes through the ringer with varying terrain, distances, conditions and have found the Vazee Summit to take a beating but nothing to show for it. There were a handful of reviews singling out concerns with the sole separating from the heel and a little tearing of the upper but, by and large, the feedback was exceedingly positive in this area. Beyond its sole unit built for toughness and its well constructed upper securing the foot, the upper also contributed to the shoe's longer life with its ability to drain water well too. The Vazee Summit aims to get trail runners moving quickly with confidence in the great wide open. With a 3/4 RockStop rockplate to prevent damage or injury to the foot in more technical conditions, the shoe is still able to retain flexibility in the midfoot due to its placement and amply buffered outsole. Also protecting the foot is the construction of the upper, with its multiple synthetic overlays and toe cap that protect the feet from debris. The upper is also crafted with breathable mesh that has been cited as draining water well which precludes the wearer from enduring sweaty and wet feet that could lead to discomfort or injury. Most seem to find this shoe moderately protective. The REVlite foam of the midsole helps provide a springy feel while the outsole's hydrohesion rubber maintains the softness. With one continuous piece of rubber running the length of the shoe, and the fact that the shoe's lugs are large enough to not collect mud or debris, this shoe keeps its grip secure, allowing for a more pronounced ground feel and no slipping. This responsiveness creates the right environment for runners to reduce leg fatigue and focus on traversing the technical trails ahead. Running with the concept of a racing flat as the basis and adding on from there, it's no surprise this shoe offers less cushioning with basic support, but most still find it to be very comfortable and appropriately supportive for their needs. Some felt that, for its lack of underfoot softness, it should be marketed as a minimalist shoe but overall, feedback was positive that it offered the right ratio of support and comfort for the distance trail runner. One of the highlights in the New Balance Vazee Summit is its FantomFit upper. Lightweight, thin, and soft, it fits the foot like a wrap-around slipper, helping to keep it from moving as it glides over the trails. Most found this feature to be a welcome addition. Despite this, the secure fit did not offer enough support to meet the needs of the high arch runner - and the already narrow fit left little room for orthotics. Protecting the toes from damaging impacts is the Toe Protect toe cap with added welded overlays in the area. Some felt this did not really stand out as offering much additional protection. Additionally, another support feature is the inclusion of traditional flat laces with a stability hole in the upper. A few wearers thought they could be longer, some thought they were unremarkable, and some were pleased by the simplicity of the laces. Intended for trails of all surfaces, the New Balance Vazee Summit pleases most. Some say it transitions well from road to trail as well, but most claim the firmer cushioning can not really offer comfort when standing up to a hard pounding on solid packed surfaces for longer distances. Based on the last of the New Balance RC1400 racing flat with the protection and grit of a solid trail kick, this shoe really is an amalgamation of the best of both worlds. With its hydrohesion rubber, it gains the ability to run with confidence in wet conditions, the strategically patterned 4.5mm lugs are well-suited to tackle more tricky surfaces, the 3/4 rockplate that still retains flexibility of movement allows for trickier terrain with roots and rocks, its snug-fitting upper works to hold the foot in place while barreling downhill. It seems this shoe can handle however the trails challenge it. Introduced at a slightly lower price point and very reasonable cost compared to similar models, this shoe, provided the narrower fit works for you, seems like a great buy. And, with its recent price drops, is a definite must try. With a hydrohesion outsole sporting a well thought out patterned series of 4.5mm lugs, the New Balance Vazee Summit promises a solid grippy ride through some of the toughest and wettest terrains. The rubber has been improved to offer additional traction and better durability and reviewers are pleased that they can feel confident as they go the distance wherever they may roam. Rated as highly flexible, the Vazee Summit encompasses the best of both worlds: racing and technical trails. The upper is soft and pliable while keeping the foot in place. And, depsite the higher drop, the midsole, comprised of REVlite foam, is responsive and light for swift kicks, and the incorporated rock plate that protects the under foot from damage is made of a flexible TPU to allow for quick maneuvering on the trails. 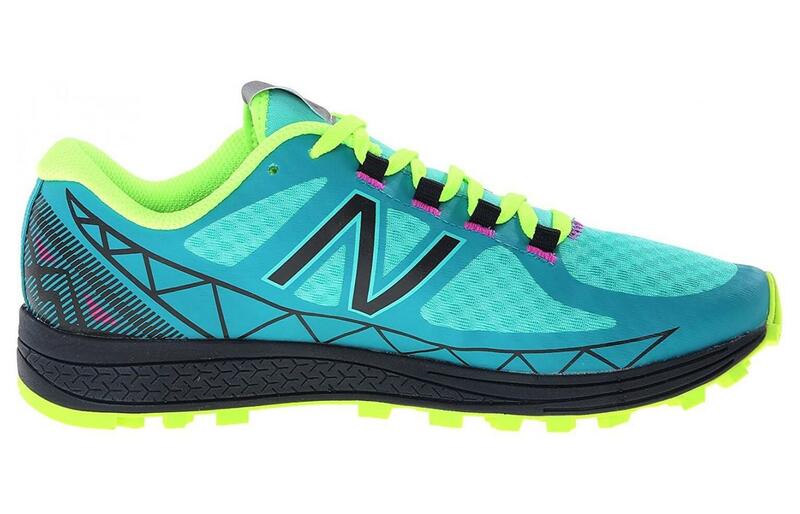 The New Balance Vazee Summit is a neutral trail running shoe. While it doesn't offer stability features, and those with high arches have been prone to find it not right for their feet, it does do its part to provide a secure, stable ride for many. The interior plastic heel cup and FantomFit wrap, and the construction of the upper with its strategically placed overlays, including the toe cap, help hold the foot in place to prevent rolling or sliding. The Midsole's REVlite foam, well-placed lugs, and the flexible TPU rockplate all contribute to provide a firm and stable footfall. Both the men's and women's version of the Vazee Summit claim a 10mm heel-to-toe drop. Measuring a 27mm heel and 17mm forefoot, this is on the higher end of the spectrum which concerned some wearers but these reservations were assuaged by its actual wear feeling overwhelmingly like that of a drop much lower like 6 mm, causing less issues when transitioning between shoes with lower drops. Based on the last of New Balance's well-received racing flat RC1440, this shoe offers an exceptional blend of features making it perfect for the speed, agility, traction, and durability required for long trail runs or races. The hydrohesion rubber compound of the sole contribute to its effective handling in wet conditions. The outsole's 4.5mm lugs are perfect for not trapping mud and debris and provide a stable and gritty base for technical terrain. After an initial break-in period, most found this shoe to be very comfortable and responsive. Tending to run small and narrow, it aims to lock the saddle of the foot in place, but this sizing makes it not the right shoe for those with wider feet. Most are pleased with the overall style. While the New Balance Vazee Summit fits slightly snugger, this is not necessarily a bad thing to most, as it is intentionally designed to lock your foot in place for security and injury protection as you bomb the hills. There may be some that have legitimate concerns over sizing despite the shoe's availability in normal and wide width, but overall, it is well-received. There are those that lament that the MT100 series has been discontinued and were hesitant to give this shoe a try. By and large, most did not regret it: this is no replacement, but rather a whole different shoe that many feel really improves on what a trail shoe should be. It's racing flat inspired blueprint and rugged trail features make it a standout. Add in its reasonable asking price and this is a must try!